Today, am going to write about job hunting and the technology, how to apply for latest jobs in Nigeria Via the Internet and get invitation for an interview. You see, days had Gone when Wednesday Guardian used to be the number one Newspaper for job applicants looking for new job opportunities in Nigeria. If am to remember My Secondary School Days, back then I use to go to the Library, The Jubilee Library In Port Harcourt and every Wednesday Use to be overclouded day in Jubilee Library, Do You Know Why? Thank God for Innovative Technology, Those days have been a thing of the past. Today 90% Of Latest Job Listing is done online and you as a job hunter can apply for jobs online in Nigeria without stepping out of your bedroom. Funny as it’s in those days, if you are applying for a job in Port Harcourt from Kano, you would have to travel down from Kano to Port Harcourt just to submit your application CV. Sometimes, even after putting all these efforts and risks your life, spend your time, and the little money you have or someone gave to you, your application letter may still end up not getting to the hands of the human resources in charge of the Job Listing. You can search for jobs from multiple companies, write your application, upload your CV and submit You CV to as many companies that listed the job opening in around the Nation. Without visiting the organizations until you are invited for an interview. 1.. Write Your CV ( Resume ) –: If You are Hunting for Job, consider writing your CV ( Resume ) As First Priority. There are so many jobs listing directories websites in Nigerian and here are some I will like you to use, just copy them and held to them at your leisure time and start uploading your CV on them. And lastly Do not be in a hurry to submit your application, make sure everything is ok, read, reread and read again, that is to say, always review your application to be sure it is errors free before hitting the submit button. Never You Accept To Pay Any Body any amount of money in exchange for job offer, not even when they tell you that they have the slot in NNPC, Shell, Offshore Work, Onshore work and the rest. Once their intent for contacting you get to you giving them some money before they will offer you a job they don’t have or link you up for a job. 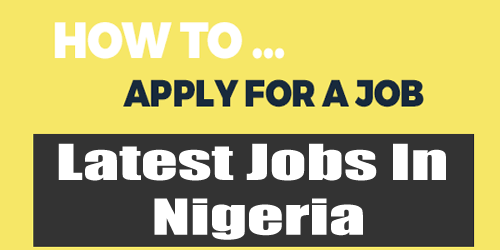 0 responses on "How To Apply For Latest Jobs In Nigeria"